The teachers performing their group dance. I remember when I was a Freshman, wearing yellow and watching Seniors dominate in their black attire. It seemed like they dominated the school in every aspect while having the time of their lives. As a senior now, I feel like I am on top of the world. Being accomplished in tackling the hardships that high school throws your way, I feel nothing but enthusiasm as I sit on the bleachers for the Homecoming Pep Assembly one last time. The games that students participated in were very competitive. One particular game was throwing a football to some bowling pins. This tested the aim of the participants while symbolizing the football game that occured the following night. 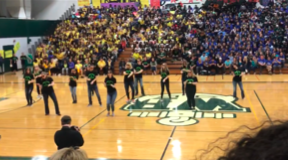 The teachers joined the Swamp with their group dance, and from Miley Cyrus to Hairspray, we were truly entertained. Part of the reason that stems my enthusiasm for my last Homecoming Pep Assembly is seeing my friends become leaders within the school community. Many of them were representing their respective clubs and sports with the poster line up in the beginning of the assembly, while my fellow classmates were the Swamp Leaders and on the Homecoming court. 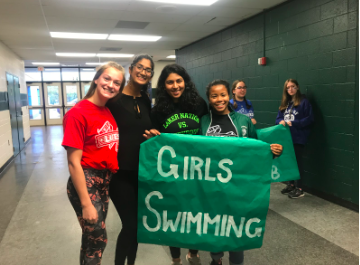 My fellow Swim Team Captain, Durga Shanker, said “Being able to represent the Swim Team during the Pep Assembly is so cool! It has been a long journey through high school and I can not wait to see where the future takes us next!”. The Poms dance, Cheerleading presentation, and Marching Band were all lead by my peers who spent years working hard towards that goal. Seeing everyone live up to their potential in high school was definitely a highlight for me in the Homecoming Pep Assembly as a senior. As a Freshman, my first ever pep assembly experience was overall- amazing. Except for when the seniors cheated in tug-of-war. The environment was amazing, everyone came together as a school community and had a good time together as we shared talents, performances, and got to know one another. 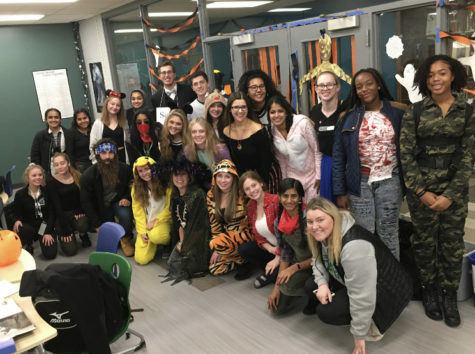 The school is a light hearted community and just a really big family.